Bookbinders Design is a Melbourne based store that make their own notebooks and other paper products and also sell some other fine stationery products. They approached me to review one of their notebooks. The notebook I received is this 210 x 240 mm Cloth Bound Hardcover Notebook. Bookbinders Design offer a variety of colours and I was sent a red one. I was initially sceptical and because my blog is Fountain Pen focussed (and because notes books do not need to be designed for Fountain Pen use to still be a good notebook) I asked about the Fountain Pen friendliness of the paper. They sent through a photo and I was pleased with how it looked so I accepted their offer. There was radio silence for a shot time and then a red notebook appeared in my PO Box. What a pleasant surprise. Even more of a surprise was the macchiato man logo imprinted on the cover. A nice touch. I quickly got to testing the paper with fountain pens, and also some pencils, ballpoints, a rollerball and dip-pen ink. The paper is Swedish fine paper 100gsm and is very smooth. Around as smooth as Rhodia but just a touch rougher. It’s firm paper as well. It’s firmer than most Tomoe River paper and 90gsm Rhodia and about the same as 80gsm Rhodia. The paper does feather with poor performing inks like Noodler’s Baystate Blue, Noodler’s Bernanke Blue and Bungubox Luminous Green. I don’t consider this a negative to the paper! These inks also feather and/or bleed on Rhodia. Would would have been a boon for the paper had it handled these inks well, but I don’t think it should be judged by these inks either. Other inks it handles admirably. From Organics Studio, to Robert Oster, to Aurora and to Sailor inks. All write nicely. There is a slight hint of ghosting which is surprising for the thickness of the paper but I don’t find it distracting. The paper is comfortable to write on with a pencil. I don’t like pencil on Rhodia or Tomoe River, it’s too smooth and thus too pale, but I also don’t have that much experience with pencils. The dip pen ink, the rollerball and the ballpoints work without issue. The ink produces a similar amount of sheen to Rhodia. That is, not very much. It is there but you wouldn’t use this paper to show of sheen. Where this paper truely shines is with shading. For some reason this paper really exaggerates shading. Even Baystate Blue which is usually a very flat colour has a subtle amount of sheen. Ishimaya Bungu Hachimanzaka Blue is almost two unique colours and KWZ Honey also looks fantastic here. Bookbinders Design state that the paper is Acid Free, Totally-Chlorine Free (TCF), Age Resisting and Forest Stewardship Certified (FSC). This should be good for the longevity of what you might be writing in the notebook so Noodler’s Eternal inks, Iron Gall inks or other permanent inks should be effective on this paper. I, of course, can’t test this theory! The section sewn, hardcover case-bound notebook a single black bookmark tab. The bookmark tab has frayed at the end but the headband, the spine, the end paper are all glued together well. Nothing is lifting up, it’s all even and well folded. I’m not an expert with bookbinding but I can’t see any issues here so I say it’s good! The notebooks are described to me as hand processed. I don’t know the details but Bookbinders Design described the process as “skilled craftsmen utilising basic bookbinding machines”. Of course what is hand-made is a complicated description because at what level of tools being used does it stop being handmade? They did say that it was not a huge production line so I’d consider these books to be at least somewhat handmade! I expect that what they have is more sophisticated than a folding bone, a paper press, and a needle and thread but I also believe actual people have a good deal of influence on the process. The notebook, unfortunately, doesn’t lie flat. The more square like shape means you get a more traditional notebook aspect ratio from the book if you discount a portion near the spine. I’m fine with this but I can see why this would be an issue for some. My notebook is the blank version. It also comes in lined and I am told that dot grid or grid is coming soon. I welcome that! The size of the book is quite large, because of that it might fit in fewer bags or carry cases. I see this as less portable than other notebooks. The lack of portability might be a blessing in disguise for some people as I found the cloth cover does attract dirt and smudges a somewhat easily. This isn’t a problem for me, but if it is for you then this book might be best left at home or somewhere clean. The logo is very nicely done. Bookbinders Design use a debossing die, that they keep for future possible usage, to stamp a logo onto the book. You can see the debossing die used for the macchiato man logo bellow (photo from Bookbinders Design used with permission). The cost is cheaper for subsequent orders because the die is already made. They also offer your initials for free, short text for AU$15, 1 line of text for $54 and 2 lines for $78. This notebook works well with fountain pens. Broad nib, fine nib and in between. It’s produces just a little sheen but some great shading. It doesn’t lie flat, and and the cover lies flat but for me the positives outweigh the negatives, especially with a custom logo on the front. At AU$54.50 (US$42.80) this notebook isn’t cheap, so that is another thing to consider. At that price I don’t think that this should be a notebook you write scrap notes in, shopping lists, or to-do items. For throw-away bits of information I don’t think you’re getting value for money. Where the price of this notebook becomes better value is if you use this notebook for something more permanent; a journal, a commonplace book, or simply notes that you want to keep. I think this notebook is best for permanent thoughts and writings. The acid and chlorine free age resisting paper also contributes to this usage. I use this for my drafts and notes for this blog. Given the logo embossed on the front it’s a no brainer. When this book runs out I’ll be sure to buy a replacement. The fact that adding initials are free is great for a journal. The free shipping threshold in Australia is at $55 (which is better than many) but as this is 50¢ more than the book costs, it’s definitely worth buying something small to reach that threshold. 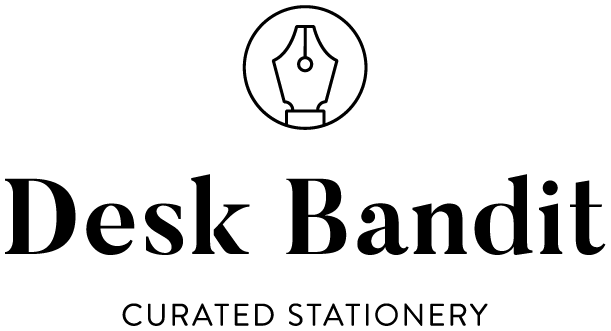 Bookbinders Design currently have a limited supply Fountain Pen stationery, apart from paper products - only the Caran d’Ache 849 Fountain Pen and some Caran d’Ache cartridges - but they are planning on expanding that soon to some familiar and well regarded brands. I received this notebook free of charge for the purpose of giving an honest review. I was not otherwise compensated and everything here is my own honest opinion. There are no affiliate links.